And, well, it’s a new season and a new year always brings hope, eh? Those who have followed VLM for a few years know I don’t get too high or too low based on the first game of the season. So the loss is not a major concern. It may be a harbinger of things to come, sure, but just as often the first game of the season is an outlier. But opening night triggers (before I get back to the Hab encounter) one of my fondest childhood memories of NHL “opening night”—and it’s not even about the Leafs. By the 1962-’63 NHL season, I had already embarked on a lifelong hatred (in hockey terms, only) of the Montreal Canadiens, even though I was only nine years of age. I’ve written about this at some length here before, and in my eBook, “The Maple Leafs of My Youth”. Living with a house full of rabid Hab supporters (starting with my Dad) drove me in the other direction. 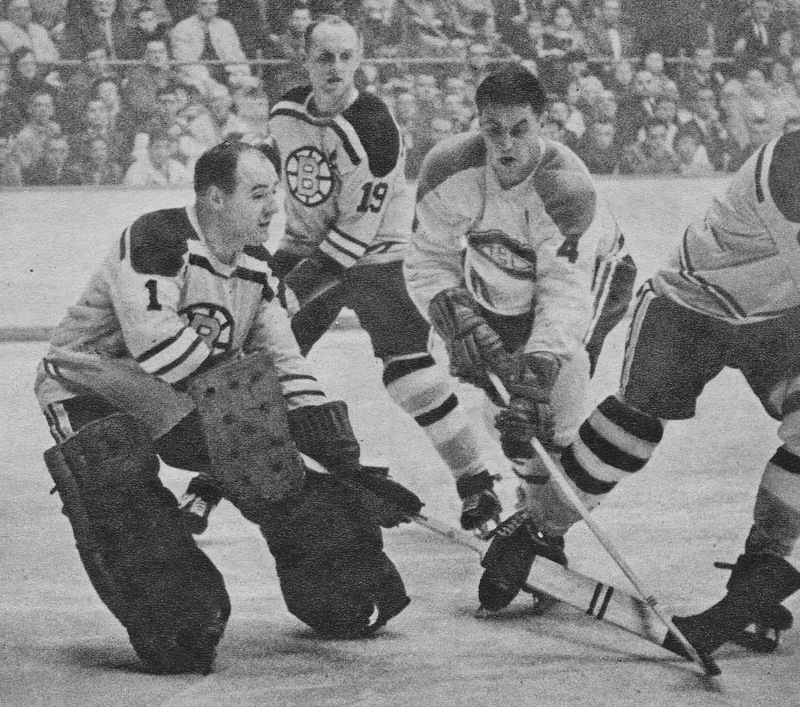 So I always remember that, on the first night of the ’62-’63 season, the then lowly Boston Bruins hosted—and upset—the powerful Canadiens by a score of 5-0 in the tiny, old Boston Garden. In goal that night for the Bruins was Bob Perreault. I remember, in part, because I read the newspaper the next morning and there was a picture of Perreault in the paper. Perreault had started his career in the NHL years before with Montreal, even earned a shutout with them in his short tenure there as a fill-in for future Hall-of-Famer Jacques Plante. He later played a few games with the Red Wings. But this game against Montreal was an opening night shock (and a pleasant surprise) to me. Kozun’s early jump. Might he be one of the surprises we talked about (hoped for?) in training camp? He certainly wasn't on my radar screen/projected lineup before camp. Percy’s impact, including his taking a hit to set up Bozak’s power-play marker in the final minute of the opening period. He was on the ice for the final Montreal goal, but I thought he played hard and well in over 20 minutes of action. Kadri opening the season like he opened the pre-season, with a goal. Kessel with some defensive positioning that stymied the Habs on a couple of shifts in the second period. (Even on Subban’s third period goal, Kessel was with his man at the edge of Bernier’s crease…) He finished a minus 2 on the night but that wasn't all on him. Seeing Rielly and Gardiner together, especially on the power play. All that said, the Leafs fell short against their longtime rival. There may be some things you want to add to my notes above, including some observations that you weren't happy with (e.g. some long shifts; why our third defense pair was on the ice in the last minute of play...). The youngsters (Percy, Kozun, Rielly who all got points) and Santorelli impressed me. The 1st line seemed a bit off, with Kessel and Bozak having missed some preseason with injuries, but still played over 22 min. That's a little concerning after last season. Knowing they are coming off injuries, I would have liked to see them rested with more minutes given to the Kozun, Kadri, Lupul line, who I thought played very well. I was relatively happy with the game. For a few years I have been saying that we have some nice prospects on the Marlies. All last year I wondered why we just couldn't bring up a guy here and there, just to give them a look and a chance. Well, we have lots more where Kozun and Percy came from. After the tying goal they should have locked it down, played for the tie and point, then tried to win 2 points in OT. Why was Kadri on the ice for the Habs winning goal? He is prone to mistake along withthe great offensive plays. They should have had defensive forwards out to end the game. The third line or Komorov, Santorelli and Clarkson might have been tired from just scoring, so why not throw out a mix of defensive guys Winnik seems dependable, Bozak can take the draw. Kolzon plays the PK and was the only forward hanging back on the goal. I blame Carlyle for not coaching to get at least a single point. That sort of thing can bite you in the end of the season. In the year we made the playoffs, Carlyle matched the lines and was working every advantage. When Carlyle talks about "better compete level" maybe he needs to look in the mirror. He would scold a player for not making the safe defensive play, maybe Carlyle needs to make the safe coaching choice. Oh well, that Montreal team is very good. At least the Leafs won't get overconfident early in the season. It did feel that we needed to play to get the point and then take our chances in overtime, DP. Make sure you get the one point and go from there. I have to agree that Carlyle didn't make a good choice for the barrage at the end. A hard spot to put young Percy in, steady as he was, and Kadri in a defensive role made no sense. Komorov at 50% was the better option on face-offs last night and Winnick is a PKer. The Leafs have something to build on, Colleen. I think all the forwards played at least 10 minutes, which is better already than last season. With luck, that game should have gone into overtime. My post sounded very negative. I was actually happy with the game overall. I thought the 1st line was a bit off, with Bozak and Kessel just coming off injuries, yet they played over 22 min. I would have liked to see the 2nd line given some of those minutes rather than risk a set-back. I agree with your "things to like", Michael, though it's still glass half-full/half-empty here at O'Malley Manor. Percy seemed to keep his composure throughout the game, and definitely caught the Montreal D off guard when he led the rush that resulted in Bozak's goal (nice feed, too). Kozun looks like he could be a real spark plug, if he can take the rigours of a full season. He made a great play on Kadri's goal, and consistently beat guys to the puck. Robidas looked solid. Komarov was his old self, finishing checks and generally making life a bit more difficult for the opponents. I also thought the Leafs defensive play - in the first period - was a harbinger of good things to come. No sooner had I topped off the glass with a robust red than the second period had me draining it. The Leafs reverted back to old habits, lost the momentum, and never really regained it. As the third period progressed, I tentatively refilled the glass, only to drink it halfway down. Ah well, like you, I don't think the first game means much. We'll wait till the end of November. And keep the wine handy. I'm with you on your assessment, Gerund O'. Some good stuff and some old habits on display, for sure. Bernier wasn't at his best but did make some big stops, including what could have been a game-saver (at least a point-saver) after the Leafs tied it at 3. First game is out of there way and all the pent-up hoopla with it. Now we'll see where we really are. By the way, I like the sounds of "O'Malley Manor"! Looked better in a loss than they did in wins last year. They actually were able to get out of their own end and avoided being hemmed in for majority of game. Looks like something to build upon. Based on expectations, 3rd and 4th lines performed better than 1st and second. Percy looks like a keeper. I sense we all like Percy, Ralph (RLMcC) and it's better to have too many capable defensemen than not enough, eh? Agreed as well that the third and fourth lines showed something. For sure it's far too early to assess the team and where it is headed this season, but I did like some things that I saw last night. I think it's a fairly universal opinion that Percy acquitted himself nicely. Kozun looks pretty impressive to me, I love his energy and speed. I liked how Robidas and Polak played quiet minutes out there, and if age and injury don't catch up to them, they could do a lot to steady our defense this year. I really noticed that Clarkson played a solid, relaxed game out there. Last season he looked like he was trying too hard to live up to his contract and was just all over the place. All the talk has been about four balanced lines, and the Leafs did that last night without the face punchers. I'd like to see Ashton get some chances, if he can play ten or twelve minutes on the fourth line I think he can have a much greater impact that when he played three or four minutes on that line in the past. I'm not expecting miracles this year, but I feel as though they are headed in the right direction. I was probably most interested to see the playing time distribution, Pete. If I'm not mistaken every forward played at least 10 minutes. To show what you can do, you have to play real minutes and if the third and fourth lines can have an impact, it will hopefully place less pressure on the top line. Same with the defense and contributions from players like Polak. lats year we won but we played worse. Perhaps losing will bring us to the right track. The Leafs were terrible in the faceoff circle. Bozak too. I think we were better than in the most last year and I am positiv about the near future. Some lucky goals for the Habs imagine we had more luck and Lupul hit the goal a few minutes in with that great chance and Bozy had scored the hattrick he could have and Bernie at least could have got one of the two. Sigh. We should leave Carlyle alone. Shanny and Nonis wanted him to stay and he will get a real chance. We should Support him in that time. He is open to change. Letting the second line play at the end of the game is a sign of that change. Last year he played the third line in OT the whole five minutes to get into the SO. You have to risk somthing to win. He did yesterday. We lost. But Carlyle is willing to change and to try things and that is good. Having faith in Percy who played great was also a good sign. He deserved to Play in the last minutes, he was their best defenseman. Kadri has to show that he can play in these situations. You make a very fair point about Carlyle, Marcus. Hopefully as fans we won't rush to judgment. He deserves time to show he can adapt and build a good team on the ice. If the players are genuinely coachable and things still don't work out, then yes, changes will be made. But let's see things play out. here is another Thing I forgot yesterday. Something very positiv. None of the three Leafs goals was (was or were?) scored in the typical Leafs fashion, of the rush. All three goals were scored by pressuring the offensive zone and making good plays. And this is a very very good sign!